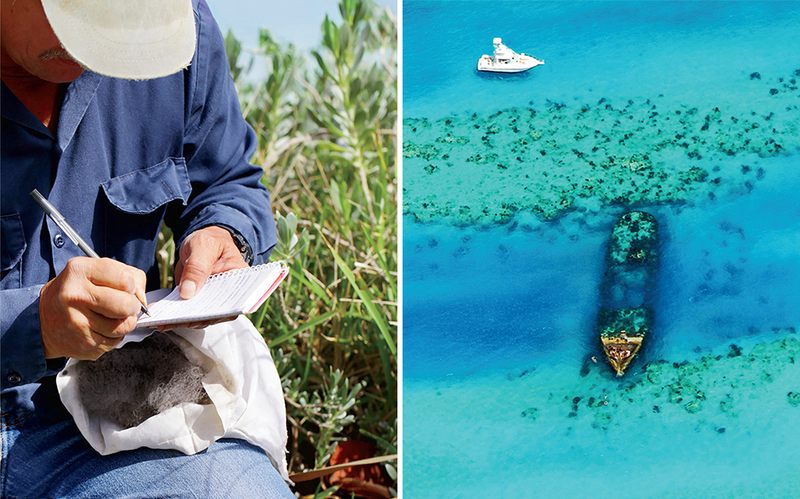 By mapping shipwrecks and nurturing sustainability, Bermuda is delivering lessons on history, biodiversity and marine heritage. 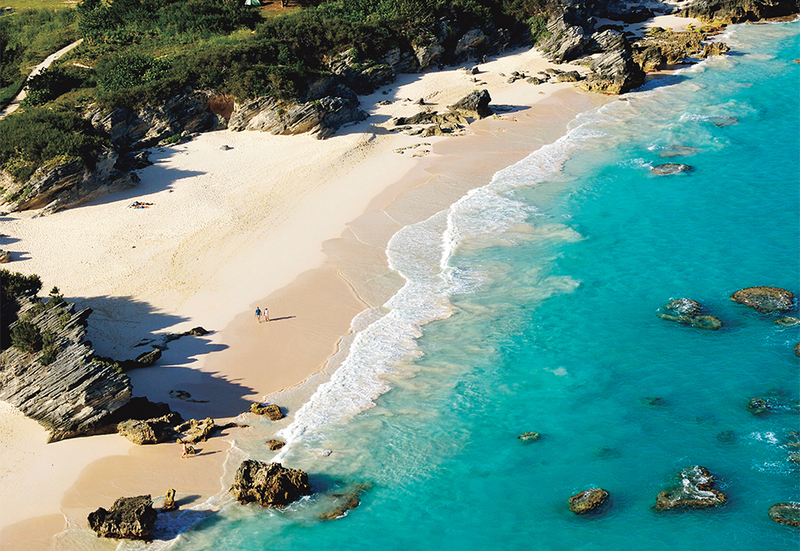 Famous for its shorts, big onions, sailing regattas and colonial charm, Bermuda is an island paradise—romantic, private, even a bit mysterious. This subtropical island chain in the North Atlantic Ocean also happens to be the shipwreck capital of the world, with more than 300 spread across 250 square miles of coral reefs. The ships started coming—and sinking—in 1609, most on their way from England or Europe to the Americas, unaware of the treacherous shallow waters they were sailing into. Each wreck offers a unique window into the maritime history of Bermuda and the nautical environment of the day, and each tells a different story to snorkelers and divers. Now, thanks to the efforts of the Bermuda 100 Challenge, anyone can visit these amazing shipwrecks up close online at Bermuda100.ucsd.edu. A team of researchers and conservation specialists has started mapping 100 wrecks using photogrammetry—the science of taking measurements from photographs—to create a digital atlas of the waters around Bermuda. Since the program’s launch in fall 2016 with an official announcement at the TEDx Talks in Bermuda, these experts have been digitally documenting the wrecks and building 3-D versions of each vessel. Now, 360-degree video “flythroughs” of wreckages on the sea floor and stunning interactive models are already populating the website. The project involves three principals. The Bermuda government’s custodian of historic wrecks, Philippe Max Rouja, does the diving and photography. His brother Jean-Pierre Rouja, a conservation tech developer and filmmaker, is responsible for in-the-field setups and rendering and color correction. Files are then handed off to Falko Kuester, a scientist at the University of California, San Diego (UCSD), whose team turns the raw materials into 3-D imagery. So far, 35 wrecks have been published on the Bermuda 100 Challenge website, three extensively, such as the side-wheeled paddle steamer the Mary Celestia, which sank in 1864 while running supplies to the American Civil War. “The Mary Celestia has a lot of relief and dramatic features that people will enjoy seeing,” Philippe says. Bermuda’s national identity is profoundly linked to its shipwreck history. And the more than 300 wrecks have long enjoyed a new life as dive sites and artificial reefs. And although preserving history is the main goal, the Bermuda 100 Challenge has many benefits. While people are learning about history, they also learn about ecology, marine culture and biodiversity. The work of the Bermuda 100 Challenge is also a way to analyze not just the transformation of the wrecks but also of the marine environment itself, and the coral and fish that call it home. The fact that fishing is banned near the wrecks makes them ideal fish-protection zones. Shipwrecks are also a great way to get a wider public interested in the ocean. As many people visit Bermuda specifically to scuba dive, the industry is thriving. Visitors to Fairmont Southampton can choose from myriad diving excursions to spend time combing the wrecks or simply exploring Bermuda’s reefs. 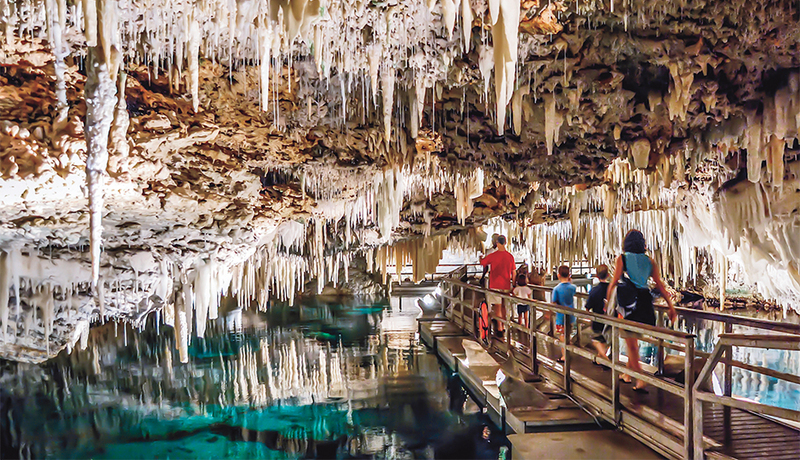 Visitors also head underground to the nearby Crystal Caves, a natural wonder of stalagmites, stalactites and clear, illuminated ponds. Sustainability has become a big trend on the island, with environmentalists, business developers and those in the watersports industry all doing their part to educate tourists and locals on how important conservation and preservation is to maintaining the well-being of the whole island. Efforts on tiny Nonsuch Island are a prime example of the work being done to regenerate Bermuda’s environment on land. The goal of this nature reserve, which allows very few visitors, is to reconstruct the fauna and flora of the pre-colonial era. This includes the rare, indigenous Bermuda petrel, or cahow, once thought to be extinct but now turning the corner toward flourishing here. A “CahowCam” lets people watch the chicks hatch in their underground nests online, a novel way to showcase Bermuda’s unique biodiversity. Nonsuch Island’s rejuvenation has also brought about the reintroduction of other species to the local community, including the Bermuda rock lizard, the West Indian Topshell sea snail and the yellow-crowned night heron. 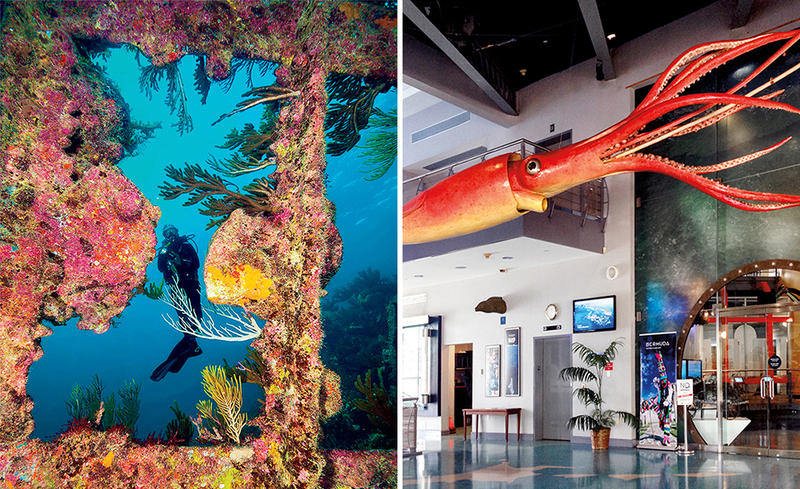 When it comes to education, the Bermuda Underwater Exploration Institute in Hamilton is an excellent place for families to learn about the island via its Discovery Centre, Shipwreck Gallery and Living with the Ocean exhibit, which studies the human impact on the marine environment. Kids particularly enjoy the Treasure Room, which displays things like rare silver and gold coins, jewelry, glassware and crockery—even a gold toothpick—all collected from wrecks on the ocean floor. Educational activities at Bermuda’s hotels get children involved, creating programs to make learning about the underwater environment fun. 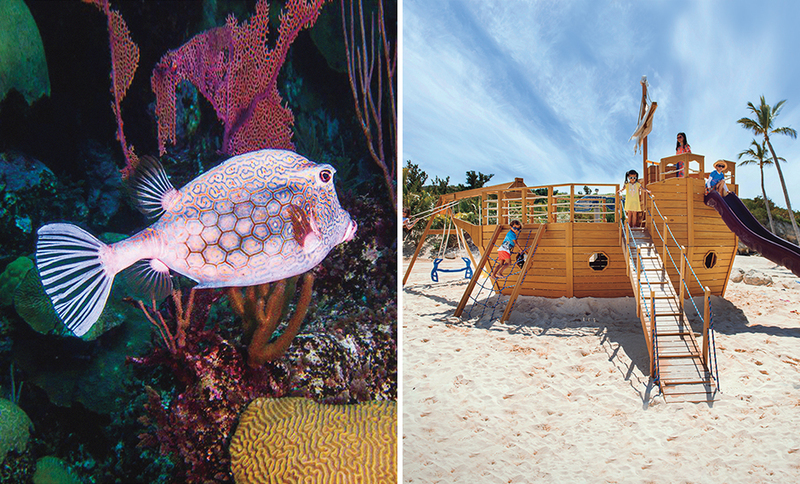 At Hamilton Princess & Beach Club, A Fairmont Managed Hotel, the private Kid’s Club has supervised activities that focus on experiential education and include themes ranging from shipwrecks to sustainability to science. The benefits of protecting Bermuda’s multifaceted heritage are many, with positive links to ecological stability and local conservation achievements. Whether it’s zooming through shipwrecks online, exploring a coral nursery in person or learning about buried treasure with your family, the story of Bermuda itself becomes the priceless artifact.